High-resolution atomic force microscopy (HR-AFM) is able to image the internal structure of molecules, resolves features in the intermolecular regions of weakly bonded molecules, discriminates between bond orders in aromatic compounds, and has opened the door to following or even inducing on-surface chemical reactions. This revolution in molecular imaging has sparked a strong debate about the interpretation of the experiments and the development of new capabilities like chemical identification. Fig. 1. Six-membered rings with N heteroatoms. From left to right: benzene, pyridine, pyrazine, pyrimidine, 1,2,4-triazine, and an s--triazine. From top to bottom: schematic representation of molecules, charge density at 0.5 and 3 Å from the plane of the molecule, and total force maps (including the effect of CO tilting) at z = 3.1 Å. 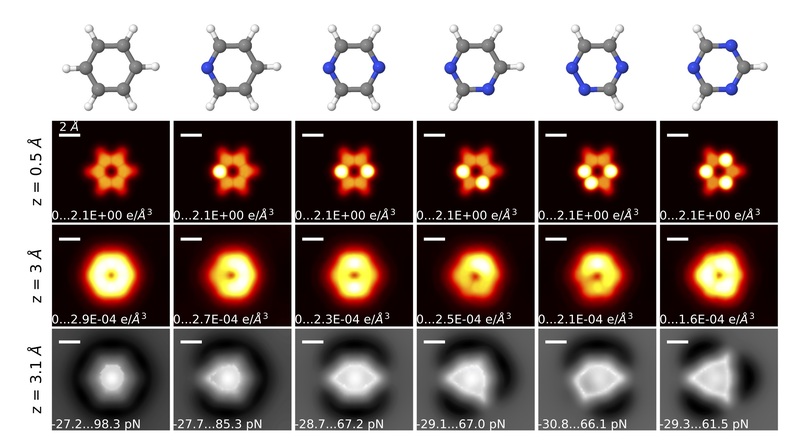 Although the charge density, and, thus, the N-C repulsive asymmetry seems to be very much dependent on the stoichiometry and bonding configuration, there is a feature that can be associated to the electronic configuration of the N: As in pyridine, the rest of the N heteroatom 6-membered rings' AFM images have sharper vertices around the N atoms as compared to the C-H groups. Far from the plane of the molecule (z=3 Å), the charge density associated with the N lone pair overflows laterally more than the C-H groups. The tip tilt, which emphasizes the saddle lines of the PES, highlights the asymmetry of the charge density around the N atoms. Thus, both the 3D force maps and the sharper vertices disclosing the location of the N atoms in the AFM images provide a fingerprint for the studied molecules.